Medieval diners drank from cups or shallow bowls. These were often made of precious metal or costly glass to demonstrate the wealth of the host and to honour the guests. Some included semi-precious stones. Large cups with lids were used for communal ritual drinking at feasts. They were occasionally inscribed with mottoes or a prayer, echoing the grace that was said at the end of a meal. Blue glass footed bowl, with white, blue, red and turquoise enamel and gilt. A leaf design around the base is in turquoise around a red stem. Account books and inventories of the time sometimes mention small numbers of 'worked' or 'gilded' glass and often this is stated to have come from Venice or Murano, the Venetian island on which the glass industry was concentrated. The value of such items was often many times as great as that of ordinary beakers and bottles which were used in much greater quantities for daily use at the dinner table. The more valuable enamelled and gilt glasses were almost certainly used for special occasions only. Their shapes were also more varied, including footed beakers and bowls, cooling vessels, dishes, ewers, basins and salts. The fact that such items were specially mentioned in inventories showed how they were treasured by their owners from the start. They were more likely to be kept in the bedchamber, in painted wooden chests, rather than in the kitchen where the more ordinary dining utensils were kept. Footed bowls like this probably had a variety of uses, but certainly had a function as cooling vessel. Filled with water they were used to keep fruit and other food fresh. 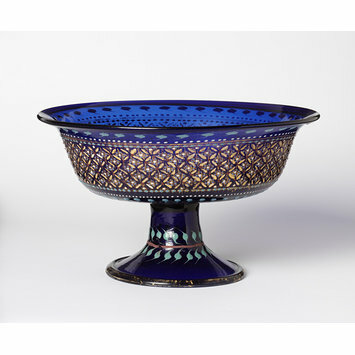 A tazza of similar shape and with practically the same decoration was in the Rothschild Collection, Galerie Fischer, auction catalogue, Luzern, August 31 1937 No. 491. Footed bowl, Italy (Venice), , 1475-1525, 473-1899 . 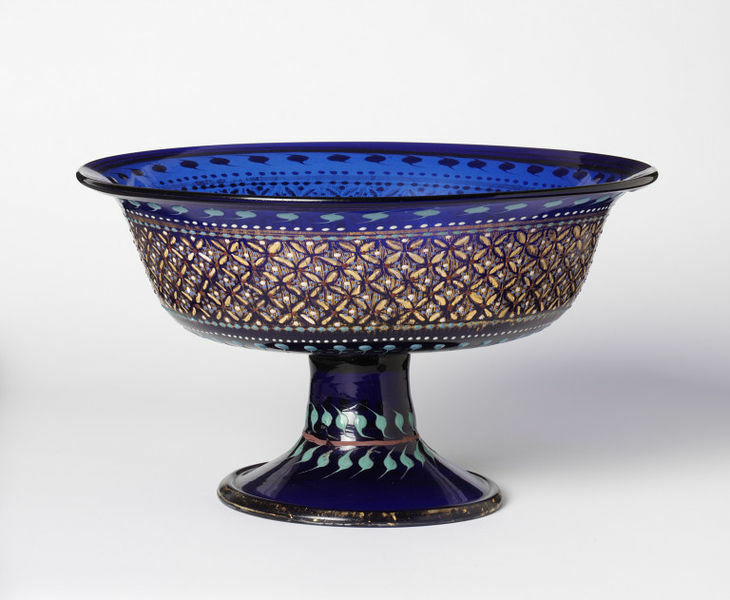 Exhib.in Three Great Centuries of Venetian Glass, Corning 1958, catalogue number 41.